"I'm not exactly a 'one guitar' kinda guy - I suppose I am a bit of a collector. But when it goes beyond 'collectability' and comes to 'real' playing - there are a couple of instruments that I truly rely on. My Yamaha SA2200 is one of those guitars." Jimi has released 13 solo albums to date, his most recent album ‘Live in the Moment’ spending quite some time in the Australian roots/blues charts. 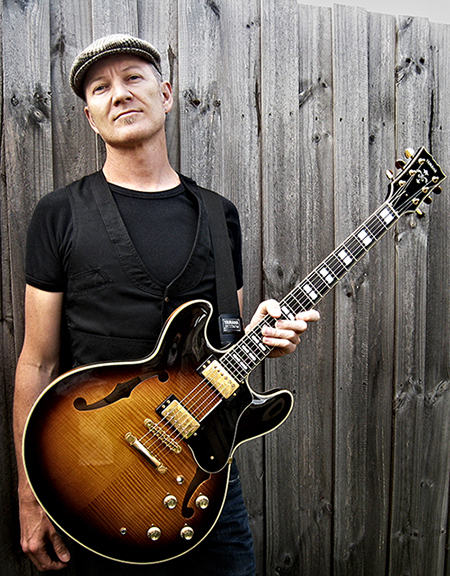 Over the past few years Jimi has worked on a variety of studio projects, producing and playing guitar and mandolin on 'Screaming Jets' front man Dave Gleeson's first solo album; adding mandolin to James Reyne’s recent album, even producing and recording a number of solo piano albums with his father Kevin Hocking. In 2004 Jimi was proclaimed the MBAS Blues Performer of the Year, and in 2005 he was the winner in the Solo/Duo section of the International Blues Challenge in Memphis, USA. He is always working on at least two or three recording projects, including a new blues album, and spends a lot of time on the road – he recently returned from gigs in New Zealand and Nepal. His list of playing credits leaves nothing to the imagination. Jimi has fronted or performed with: The Astro Boys, Swanee, The Angels, Jimi the Human & Spectre 7, The Screaming Jets, and Jimi Hocking's Blues Machine.